Candy cigarettes are now called candy stix,they are an old time retro candy from the 1950's and still very popular today. Each pack of cigarettes has approx 8 - 10 cigarette sticks. 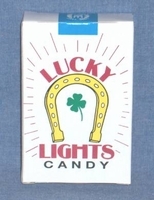 Many fear that these old time favorites will encourage kids to smoke, however it's the parents that purchase this old time candy as it brings back many childhood memories. If you perfer candy cigarettes by the case, we have that too, 24 packs per case in our fabulous 50's candy section. When I was a child we had a corner store that everyone called the fruit stand. They always sold penny candy behind the counter and kids would just line up to spend their pennies. One day I went in to get some candy cigarette sticks. I was just a little taller than the counter and asked the lady at the counter for some cigarettes as I placed my coins on the counter. She bent down and placed her elbows onto the counter so she was more my height and asked me why I would want a pack of cigarettes? I was a very, very shy girl! I immediately started to cry. She then realized that I wanted the candy cigarettes and not the real cigarettes. She said, "ohhhhh! You mean the candy cigarettes!" I couldn't talk, I just shook my head yes, and she collected my $$. I loved those things! And yes, we did pretend we were really smoking back then. But it was more fun eating them then pretending to smoke.